Leave the car park in Alwinton (NT919063) and turn right along the Upper Coquetdale road. After 1 mile take the bridleway signposted `Shillmoor`. Soon the green track, known as the Pass Peth, makes a rapid descent down to the valley. Do not follow this, just pause to enjoy the great view up Coquetdale. Instead, turn right to climb to the summit of Green Side. 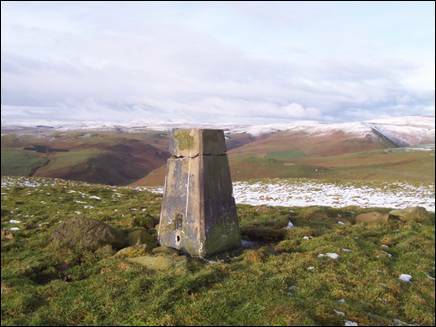 There are spacious views towards Shillhope Law and Wether Cairn. The triangulation pillar had, until relatively recently, lost its top. A repair job has now been carried out. The photographs show both `before and after` situations.